Ceylon ginger is used extensively in ayurvedic treatments for chills, indigestion, arthritis, rashes , the common cold and flu symptoms to name a few. 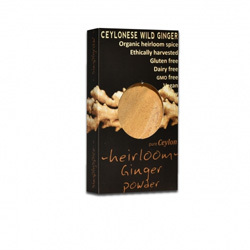 Ceylon Wild Ginger has grown naturally in the spice gardens of Ceylon from ancient times. Ceylonese ginger has tighter smaller rhizomes that are very strong in aroma and taste. Many popular Gingerbeer brands use Ceylon ginger for that very unique flavor! Carefully harvested ginger rhizomes are dug out using wooden sticks and sundried naturally. In Ayurveda it is widely used in remedies for easing soreness and pain, its anti-inflammatory properties, correcting digestive disorders, protection from infections, and controlling diabetic blood sugar as well as cholesterol levels.